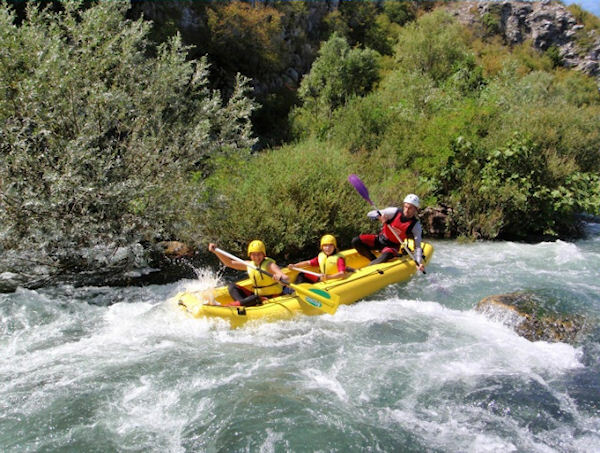 For Rafting one needs some adventure spirit and love for the untouched nature. This is the best way to discover the magnificent river Cetina and its canyons, waterfalls and the lush vegetation surrounding it. During the whole time you will be accompanied by our experienced skippers – they will make sure everything runs smoothly. After a lot of excitement you will arrive to the Radmanove Mlinice restaurant where you will be offered with delicious and enjoyable refreshment and lunch. Lunch menu is grilled meat with potatoes, grilled seasonal vegetables, salad, fruits and drinks (water, soft drinks or beer). Please note: This tour requires you to be able to enter and exit a raft and is recommended for guests who are in good physical condition. Remember to bring your camera, towel, swimsuit, water shoes and an additional set of clothes to change into. Please note: This tour requires you to be able to enter and exit a raft and is recommended for guests who are in good physical condition. Guests should be prepared for moderate amounts of walking. Tour is considered a strenuous activities tour.